With a 25% cut in water use by cities now ordered by the state, L.A. can be a lot smarter in a time of perilous drought. Here are some wise investments to make right now. California faces an uncertain water future. The record drought coupled with climate change and other stressors has called into question the practicality of importing nearly 90% of L.A.’s water supply. Simply put, being able to rely on imported water in the future is an uncertain and dangerous proposition. Instead, our region needs to be smarter about maximizing the water that we already have. We’re often asked if desalination is the answer. Unfortunately, desal plants are not some sort of silver bullet. The plants are incredibly energy intensive, expensive to build and operate, and create a whole slew of environmental challenges. Instead, our region needs to be smarter about maximizing the water that we already have. 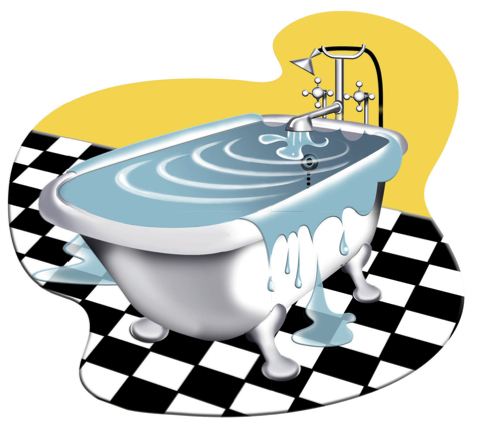 The adage of “Reduce, Reuse, Recycle” applies just as neatly to water as it does to durable goods. The first step in fighting drought is reducing demand. For example, irrigation for landscaping still accounts for more than 50% of urban water use in our arid climate. We can all do better to get on a serious water diet, such as ripping out water-intensive turf. But on the other side of the equation, the region must start to get serious about investing in projects that will augment supply in a smart way. Wasteful: Each day roughly 10 million gallons of urban runoff flows through L.A County stormdrains, picking up pollutants and eventually reaching the ocean without the benefit of any treatment. It’s why many of our beaches, rivers and creeks remain chronically polluted. This pollution along our shorelines is terrible, but the waste of water in a time of extreme drought is equally maddening. 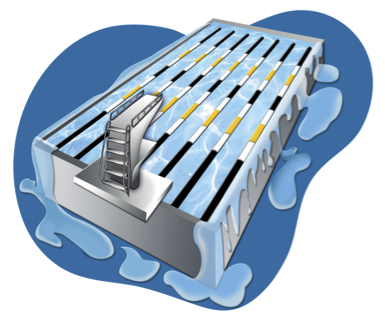 Smart: Capturing that runoff, cleaning it, and using it to augment regional water supplies. The potential: After a storm, as much as 10 billion gallons of water is wasted flowing into the sea from urban runoff. That’s enough to fill 100 Rose Bowls! Up to 630,000 acre feet per year could potentially be generated by better stormwater capture and reuse in the state, according to estimates by the NRDC. This volume is roughly equal to the amount of water used by the entire city of Los Angeles annually. Using this water for non-potable uses and groundwater recharge can greatly increase local water supplies. How to get there: It will take significant resolve and funding, but watershed management plans that prioritize green infrastructure and multi-benefit stormwater capture projects must be embraced. Portland and Philadelphia are doing it, and so can we. What Heal the Bay is doing: Our policy team is working to ensure stormwater management planning and implementation includes multi-benefit solutions that improve greenspace, beautify communities, and capture water onsite for reuse or recharging groundwater. Our staff scientists are working with state and local governments to find creative ways to fund stormwater programs. We hope to get funding in place before 2020. Wasteful: Each day, wastewater treatment plants send hundreds of millions of gallons of highly treated wastewater into local rivers and the Pacific Ocean. It’s not helping the sea, and it’s certainly not helping us combat drought. Smart: Using reclaimed wastewater to offset potable water demand and replenish our regional groundwater basins. 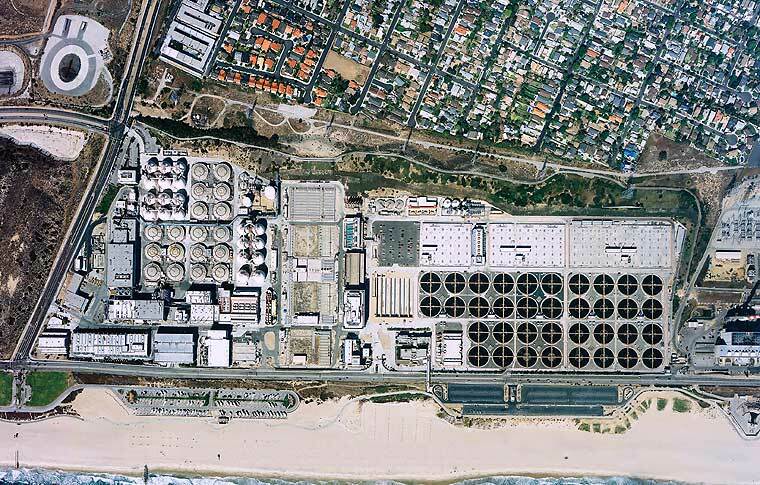 The potential: Each day the Hyperion Treatment Plant discharges more than 250 million gallons of wastewater into Santa Monica Bay. If all of Hyperion’s water was treated to a higher standard, it could be recycled and substantially reduce the region’s reliance on imported water and simultaneously bolster regional water supplies, eventually supplying enough water for daily use by 1 million people. How to get there: We need to reuse every drop of water we have, rather than just importing increasingly scarce water from outside Southern California. Orange County residents have been sourcing drinking water from local aquifers recharged with highly treated reclaimed water since the 1970s. Los Angeles needs to follow Orange County’s lead, and move beyond “toilet to tap” fears. We prefer Mayor Garcetti’s term: showers to flowers. This effort will require us to clean up our contaminated aquifers (see below). What Heal the Bay is doing: We continue to advocate for increasing recycled water use, such as the implementation of the Los Angeles Groundwater Replenishment Project, which will use up to 30,000 acre-feet per year of highly purified water from the Donald C. Tillman Water Reclamation Plant to replenish the San Fernando Groundwater Basin. Environmental review is already underway, and the city of Los Angeles hopes to meet this goal by 2035 or sooner. Wasteful: Contaminated plumes continue to expand in aquifers in the San Fernando and San Gabriel valleys, infringing on and reducing groundwater that is available to greater Los Angeles. Much of our groundwater contamination is due to historic improper handling and disposal of industrial chemicals. Smart: Removing pollutants from groundwater basins in order to enhance available storage space for stormwater and reclaimed water recharge. The potential: The city of Los Angeles has the rights to pump up to 87,000 acre-feet of water annually. That’s enough water to meet the demands of the greater L.A. Basin for two months out of the year. 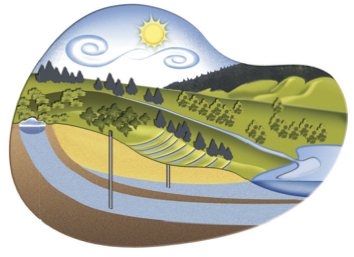 How to get there: We need to find the funding to clean up our groundwater basins. Investment is necessary to allow for our local aquifers to be used to their fullest extent in the future. 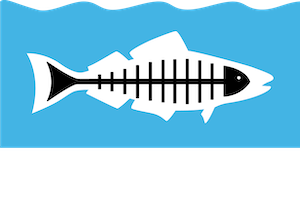 What Heal the Bay is doing: Our advocacy staff supports funding through state bond money and the Metropolitan Water District to help clean up the San Fernando Valley and San Gabriel Valley aquifers. LADWP hopes to have two San Fernando Valley aquifer remediation facilities in operation by 2022. Improved water supply and improved water quality are inextricably linked. Heal the Bay will continue to advocate for smart projects that help us achieve both goals. The drought will require sacrifice and investment. Let’s just make sure we are investing wisely. Why dump highly treated wastewater from Hyperion into the sea instead of using it to recharge local aquifers? ← Get Seafood Savvy With Nick Fash!